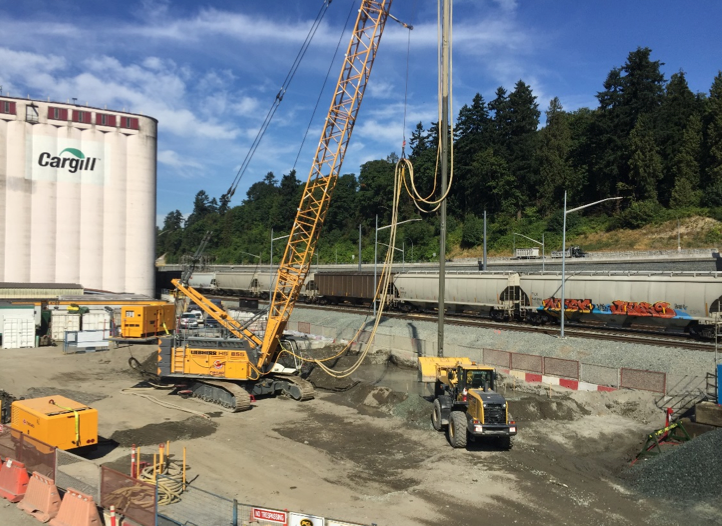 As part of an electrical distribution upgrade, Cargill Ltd. is constructing a new 69kV substation at their North Vancouver grain handing facility. In order to reduce the anticipated post-seismic ground displacements caused by liquefaction of the saturated loose to compact sands, ground improvement by Vibro Replacement stone columns was required under the substation’s mat foundation, plus a peripheral area extending 3m beyond the foundation footprint. 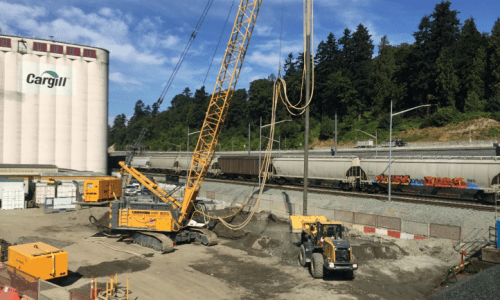 Menard utilized wet top feed Vibro Replacement equipment and techniques to install stone columns to a depth of 18.5m below site grades. The adjacent railway and gas & water lines were closely monitored to verify the Vibro Replacement work did not cause excessive settlements to these existing services. Standard Penetration Testing confirmed the ground densification program achieved the specified performance criteria.